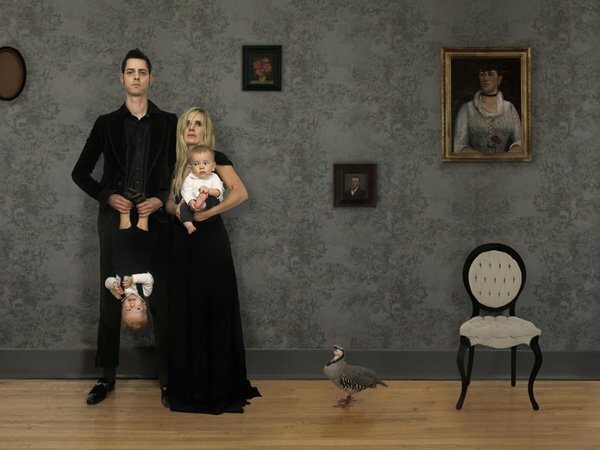 American Gothic, from the series, New Work. © Julie Blackmon. 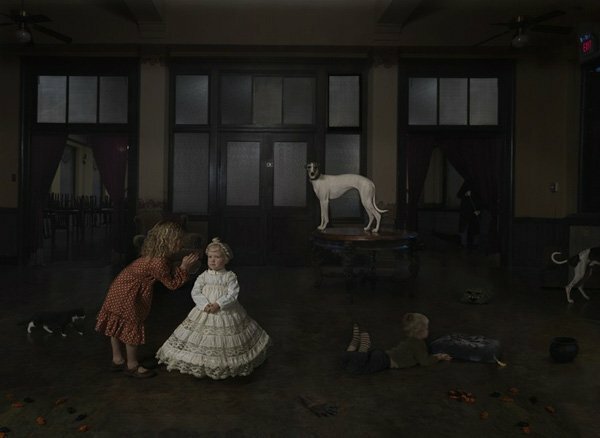 At once classically familiar and eerily chimerical, Julie Blackmon’s work draws the viewer into the everyday world of a typical suburban family with skillful metaphor and touching sincerity. Her recognition of Jan Steen as a major influence makes sense immediately in the crisp perspective of works like Concert, the painterly effect of Queen — even the proverbial subject matter and subtle moralizing of Dinner Party. The Dutch have used the term een huishouden van Jan Steen (“A Jan Steen Household”) for centuries to describe this universally common spectacle of a rowdy environment overrun with children and clutter. Blackmon’s more recent citations of artists like Edward Gorey and Tim Burton as influences are not as apparent without some closer inspection. Candy, from the series, Domestic Vacations. © Julie Blackmon. Queen, from the series, New Work. © Julie Blackmon. Bubble Girl, from the series, Mind Games. 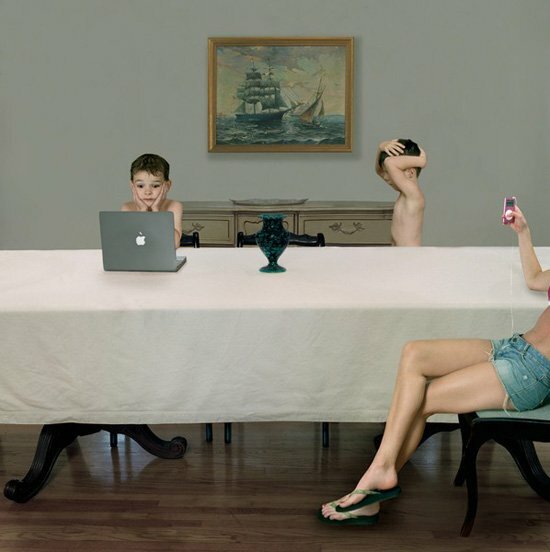 © Julie Blackmon. Live Wire, from the series, Mind Games. © Julie Blackmon. 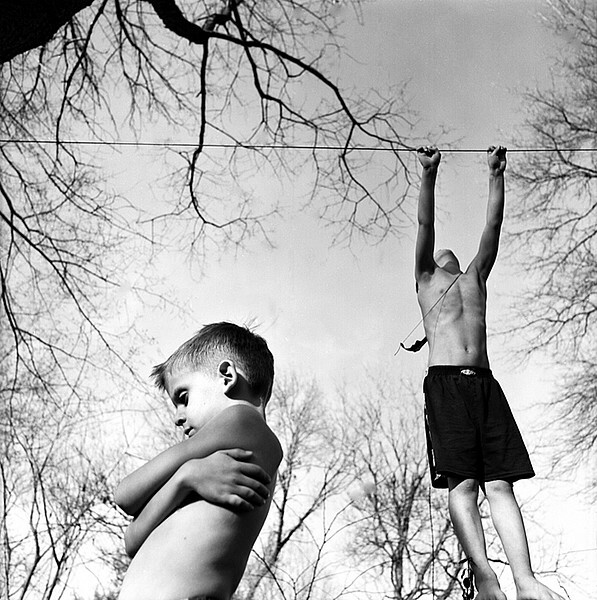 Though depicting ordinary households and commonplace events, Blackmon’s work is rich with playfulness and human drama. While often adopting visual and thematic elements of the Dutch Golden Age, the completed body of work branches into wildly surrealistic landscapes such as in Fish Tank and Flying Umbrellas; it also features some very post modern and almost hyper-realistic elements such as the tight, insistent composition, coy self-awareness, and redolent tension in works like PC and Green Velvet. Even the matter-of-fact titles of her photographs, most noticeably Floatie from Blackmon’s later series Domestic Vacations, tend to belie the subtly fantastic imagery they portray. Green Velvet, from the series, Domestic Vacations. 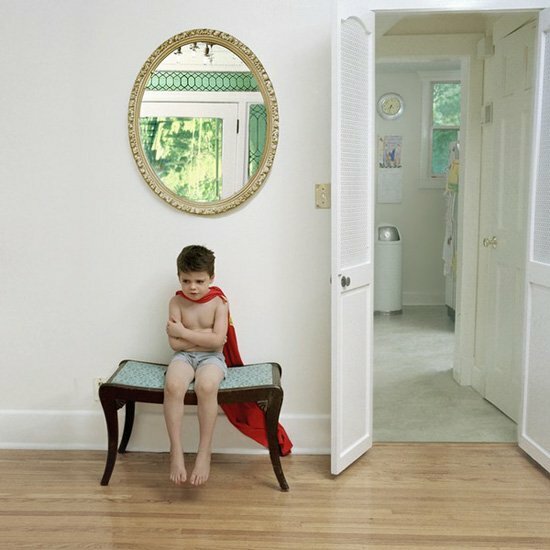 © Julie Blackmon. Girl Across the Street, from the series, New Work. 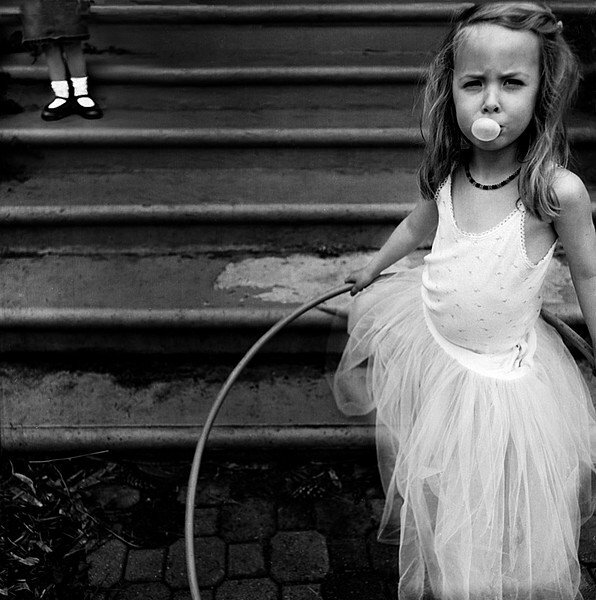 © Julie Blackmon. Time Out, from the series, Domestic Vacations. © Julie Blackmon. Blackmon grew up as the oldest of nine children, and is now herself the mother of three. 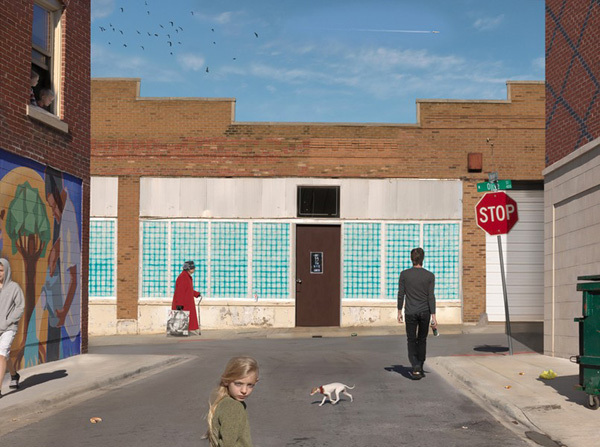 Her finished pieces are composite images of everyday scenes from her life, featuring her children, her sisters’ children, as well as other friends from the neighborhood. 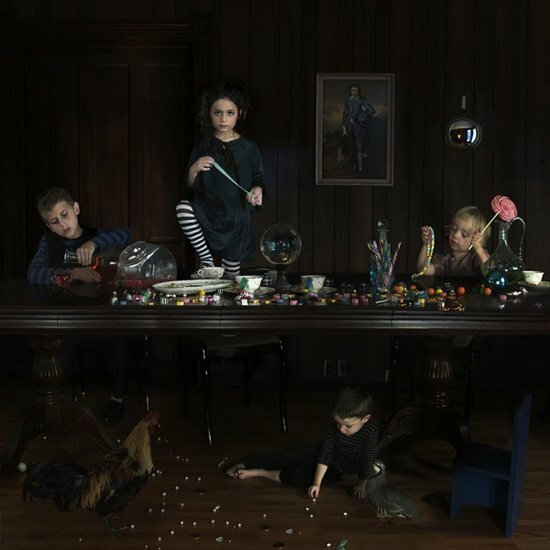 Her experience living as part of a big family has largely fashioned the theme and scope of her work, and her overwhelming choice of children as subjects lends to it a bewitching energy. Simultaneously a work of fiction and an autobiography, her art tells us of a world both pastoral and pathological, and invokes what Blackmon calls “the need to simultaneously escape and connect” with the chaos and beauty of it all. Bybysitter, from the series, Domestic Vacations. © Julie Blackmon. Olive & Market St., from the series, New Work. 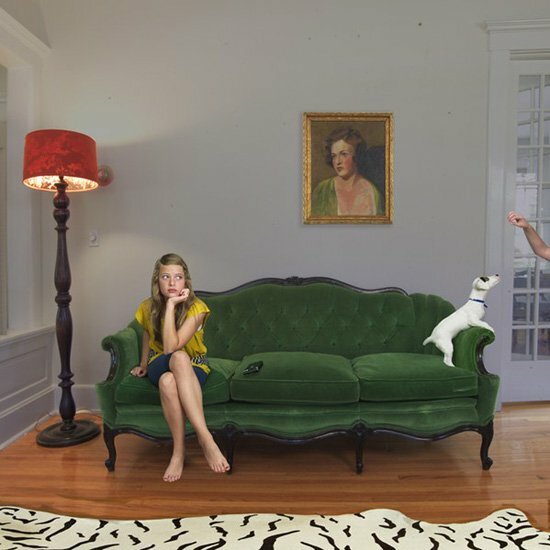 © Julie Blackmon.